GUANGZHOU, China — Three years ago, as part of its green-energy policy, the Chinese government set an ambitious goal: by the end of 2011, the nation would be able to produce at least 500,000 hybrid or all-electric cars and buses a year. With only about a week to go, it is clear China will fall far short of that target. Despite dozens of electric-vehicle demonstration projects around the country, analysts put China’s actual annual production capacity at only several thousand hybrid and all-electric cars and buses. “It’s pretty trivial at this stage — they hardly sell any,” said Lin Huaibin, the manager of China vehicle sales forecasts at IHS Automotive, a global consulting firm. Obstacles include continued technological hurdles, disputes over technology transfers by multinational automakers, and a broad wariness by the Chinese public regarding alternative-technology cars. But it would be shortsighted to count out China’s electric car efforts just yet. Only a few months ago Prime Minister Wen Jiabao called for Beijing to create a new “road map” for energy-saving vehicles. Unlike in other nations, where automakers are leading the push for electric vehicles, in China the effort is being led largely by one of the country’s most powerful industries — the state-run electric companies that operate the national power grid. With China expected to surpass the United States in the number of all vehicles on the road by as early as 2020, the government-run utilities see it as their job to provide an alternative to imported oil as a way to power several hundred million cars, trucks and buses. This month in this sprawling southern industrial city, for example, the giant China Southern Power Grid company opened a sales and service center for electric cars. The new three-story building, resembling a giant lizard egg of lime-green glass, is a showcase for technology supplied by Better Place, a start-up based in Palo Alto, Calif. Under the Better Place business model, customers not only recharge their electric cars but also periodically stop at an electric filling station to swap their nearly depleted batteries for freshly charged ones. And just because there are no customers kicking the tires now doesn’t mean China Southern Grid, as it is commonly known, isn’t in the electric-vehicle game for the long haul. The power company and Better Place are in talks to sell electric cars to the Guangzhou municipal government and to taxi fleets, according to Shai Agassi, Better Place’s founder and chief executive. The demonstration project showcases imported Renault Laguna sedans and Nissan Dualis crossover utility vehicles whose gasoline-fueled power trains have been replaced with electric motors and swappable batteries. But the companies are in talks with Chinese automakers to produce battery-powered cars, for which no price has been set. In a separate bet, meanwhile, China Southern Grid has also built recharging stations in another big southern industrial city, Shenzhen, for electric buses and cars made by a Chinese automaker, BYD, which has Warren E. Buffett among its investors. 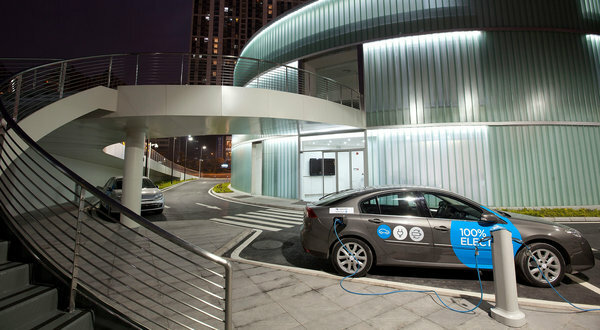 Though automakers in other countries have supplied charging equipment to be installed at homes and parking lots, China’s power industry has already made it clear that it wants to dictate when and how plug-in gasoline-electric hybrids and all-electric cars are charged, by owning the charging equipment and setting technical standards. “It is more and more difficult to manage the grid; we need more flexibility,” by controlling how cars are recharged, said Zhang Diansheng, the deputy general manager of China Southern Grid. Even some of the Chinese companies like BYD that have bet most heavily on all-electric cars are now investing in plug-in hybrid cars that have gasoline engines as well as batteries. Some of the obstacles that have slowed deployment of all-electric cars in China also exist in other markets. The cars’ range, less than 200 miles even under ideal conditions, falls steeply in cold weather, if the air-conditioner is turned on or if the car was not fully charged overnight. “I’m not interested in them — I worry I’d run out of electricity and get stuck,” said Mu Zhongbao, a 31-year-old businessman who paid the equivalent of $130,000 for an Audi Q7minivan on a recent afternoon here at one of the many dealerships near the Better Place site. Southern China Grid’s Better Place demonstration project indicates that powerful interests in China still back the development of all-electric cars. “I see the Chinese fully committed on a path toward electric vehicles — the time frame may shift, the volume numbers may shift,” said Raymond Bierzynski, the executive director of electrification strategy at General Motors China. Some executives say that China has fallen behind its schedule for hybrid and all-electric cars because it has put heavy pressure on multinationals to transfer technology to their Chinese partners to be eligible for generous subsidies for the sale of alternative-energy vehicles in China. Some foreign manufacturers have responded by withholding some of their latest models from the Chinese market — as Nissan has with the electric Leaf. G.M. has put the Volt on sale in China, despite the Chinese government’s decision to make it ineligible for renewable energy subsidies of up to $19,300 per car. That is because G.M. has not transferred enough of the technology to satisfy Beijing, although G.M. did agree this autumn to share some electric technology in the coming years. “By forcing foreign technology sources into a junior role, that’s going to significantly slow the development of the technology in China,” said Bill Russo, a former auto executive who oversaw the Chinese and Korean markets for Chrysler and is now an industry consultant in Beijing. But the betting in China is that China Southern Grid and another big grid operator, the State Grid Corporation, and their allies among the country’s five main electricity generation companies have much more influence in Beijing than the auto industry. The Chinese auto industry was tiny until the last decade, and very few of its executives have wound up in senior government positions. By contrast, specializing in electric power has long been a path to the top of the Chinese Communist Party for leaders like Li Peng, the former premier. And as long as the electric companies are influential, all-battery cars may hold the political edge over hybrids. But what is not clear is which of three experimental approaches to recharging will eventually dominate the field: the so-called fast charging of vehicle batteries at recharging centers; overnight charging options at homes and parking lots; or battery swapping à la Better Place. Meantime, World Trade Organization rules are also influencing how China approaches electric cars, said a Chinese official close to the decision-making who insisted on anonymity because he was not authorized to publicly discuss transportation policy. The government wants to build an electric car industry that can export vehicles all over the world. But it does not want to someday face W.T.O. trade complaints from other countries that might accuse China of violating free-trade export rules by subsidizing the industry’s development. With China having raised trade tensions with the United States earlier this month by slapping additional tariffs on a range of American imported autos, Beijing may need to tread more carefully than ever. The most promising trade strategy for China to avoid legal pitfalls might be for the government first to subsidize the development of a network of charging stations for electric buses and other municipal vehicles, the Chinese official said. Mass transit subsidies are hard to challenge at the W.T.O. because they involve an almost purely domestic government service. The bus recharging stations, and the lessons learned in building them, might then be used in a more extensive network of electric car recharging stations. Subsidizing the charging stations could help make electric cars more affordable, and in turn help Chinese automakers achieve economies of scale in their home market that would help them build up an export business. Already BYD is expanding its annual capacity to manufacture all-electric buses — 1,000 this year, up from 500 last year and with a target of 5,000 next year.